The 2014 Summer Forum is scheduled for Tuesday, June 3rd, at Phoenix Country Club, and the volunteer committee kicks off its first conference call next week. This years’ theme will explore Planned Giving across Generations. 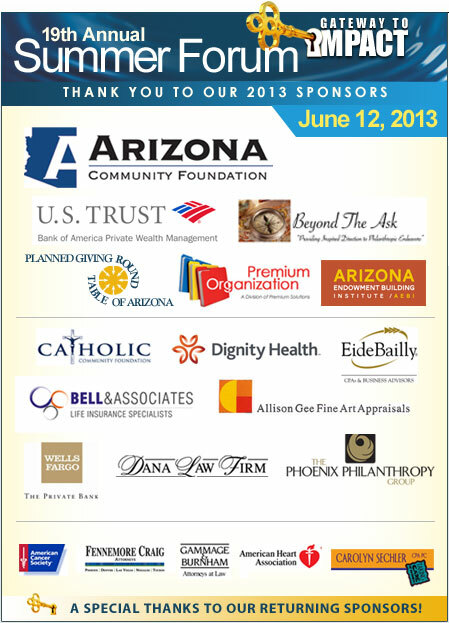 We’ve been proud to partner with many fine sponsors on this event in the past. The visibility, networking, and educational content that we provide to our sponsors matters very much to us. In prior years, sponsor feedback has indicated that we are providing great value, while increasing philanthropic know how in our community. They tell us that we raise the bar every year. We’ve been working on an easy-to-reference page on our website especially for potential sponsors. Our objective is to provide you with the information necessary to support your decision to become a sponsor. Early commitment sponsors also receive the earliest posting to our Summer Forum website pages, generally visible by March 1st for the marketing collaborators' internal membership appeal, with special bulk purchase registration options for their members. All sponsors are encouraged to join the SF committee calls, once monthly, or sit in at the Summer Forum or sponsorship committee tables at PGRTAZ monthly events, to keep up to date with event happenings, and to offer your insights, ideas, and requests. Summer Forum committee calls and membership events are posted on the PGRTAZ events calendar, visible on the home page of the PGRTAZ website.